In my whole “what should I do with my training and my foot and my life” crisis, I’m only doing things that sound fun. 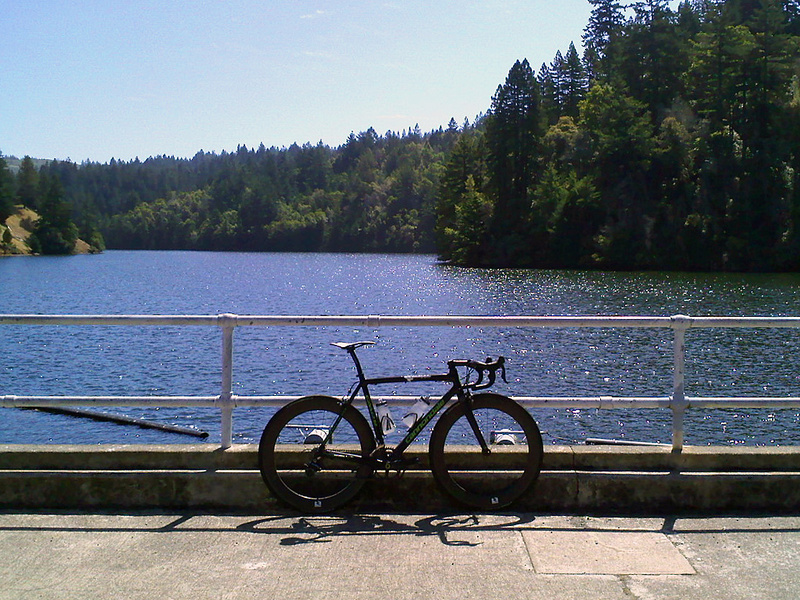 Whenever I need a ride that reinvigorates my desire to train and is cool and challenging, I ride the Alpine Dam Loop. (It also helps remind me that I have an awesome work schedule if I do it in the middle of the day.) Alpine Dam a classic in Marin. 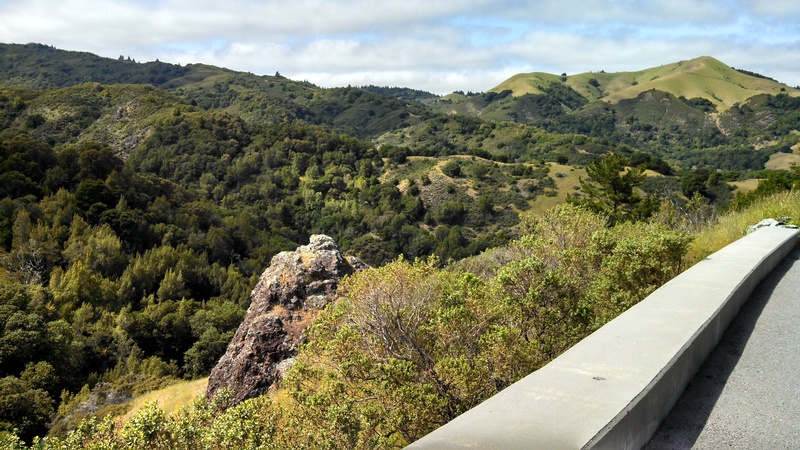 Though lots of people would argue that the riding in West Marin is better, no one gets through a visit to the county without riding Alpine Dam. Just fyi, in case you ever visit. There’s lots of ways to start the loop, but it really starts in Fairfax, at the Roastery at the corner of Bolinas Road. You’ll recognize it by all the cyclists hanging around outside. Turn left and start heading up Bolinas. It’s a 23-25′ climb for me (though just assume I biked everything 5-10′ slower today), past the entrance to the water district, past the golf course. At the top, Steve thinks he saw a mountain lion once. It’s possible. It’s also possible it was a bobcat. I’m just saying. The view on the first climb. Golf course behind me. It’s a nice climb — long and not that steep. It levels a bit in the middle and winds back and forth (fun descent!). It’s also pretty warm in the summer and is filled with cyclists. You can see East Peak of Mt. Tam off in the distance in the picture below, with The Meadow Club golf course in the foreground. 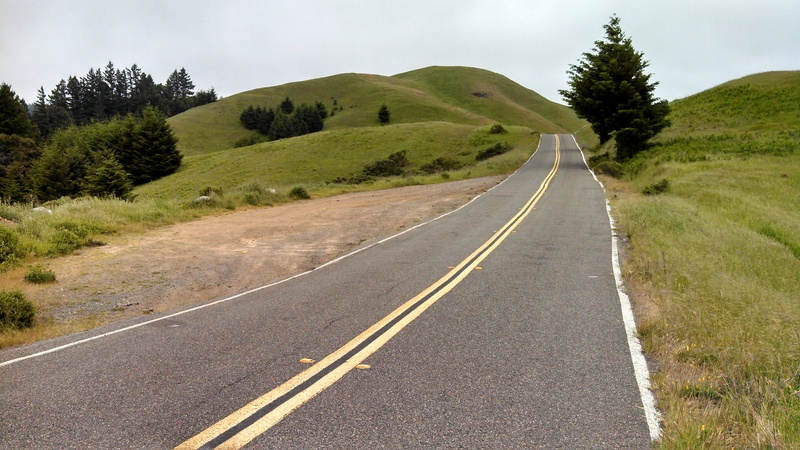 Riding (or running) up to East Peak is a good trip and one possible variation of this loop. On this part of the climb, you’ll also pass The Center for Peace and Compassion, which has a sign saying “All suspicious activity will be reported to the police.” Evidently, they are not that compassionate. Once you crest the first climb, it’s a 15-20′ descent down to the dam. It’s not all descending, though, and has some surprising rollers in the middle. In between the trees, you’ll see a lake on your left side and think you’re getting close to the dam. No, you’re not. There are a lot of lakes. This picture is actually from someone else. Because I do not ride around with Zipp wheels and also I decided I needed to get a move on actually riding and not stopping to take photos. Though you can do lots of variations, you sort of have to go across the dam because 1. it’s the only road between Fairfax and Ridgecrest Boulevard at the top and 2. if you didn’t, it really wouldn’t be called the Alpine Dam Loop. Once you go across the dam, you start climbing again through lots of trees and up into the fog, with water dripping from the redwoods. There aren’t many cars after the dam because there’s not really any reason to drive that way — everything can be gotten to easier from some other direction. One time, part of the road collapsed after really bad rains and it was closed, so there was really no reason to drive that way. Technically, it was closed to bikes too, but – since they took forever to fix it – you could just duck under the caution tape and ride up, knowing there wouldn’t be any cars at all. The morning I did that before work, as the fog lifted at the top, was one of the best rides ever. At the top, you’re technically in a state park, I think. It’s unclear. 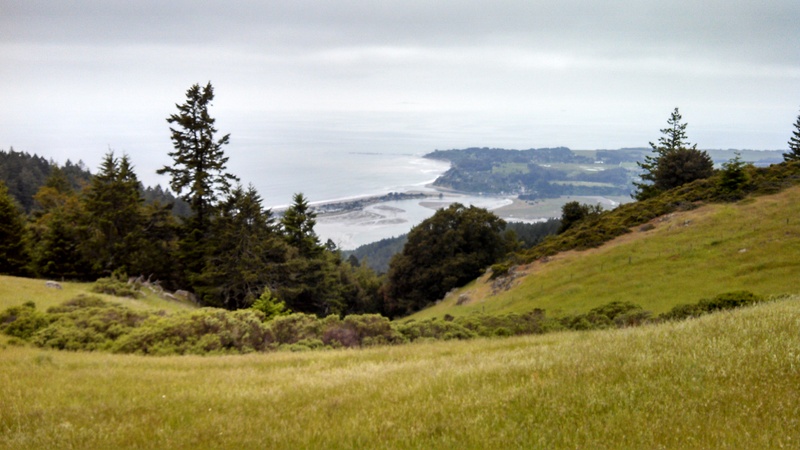 You can continue straight and descend down to the Bolinas Lagoon, but it’s not a fun descent. Instead, turn left onto Ridgecrest Boulevard. When it snows sometimes on Mt. Tam, there is a gate here that closes. Shortly, you’ll come out of the wet and dark trees. Then, you’re riding along rolling hills with mountains to one side and the water to the other. 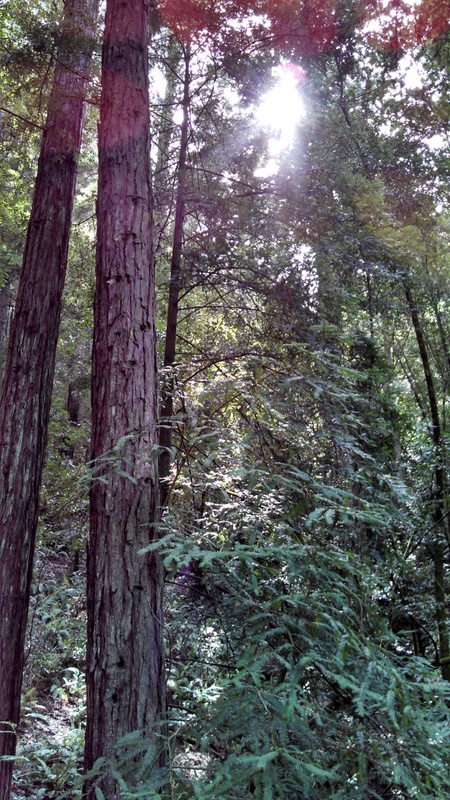 In between trees, you can look down and see Stinson Beach. Ridgecrest has been in lots of ads for shoes and cars and stuff, because if it’s not foggy it’s gorgeous. Downside: it’s usually foggy. Down there is Stinson Beach. Squint. 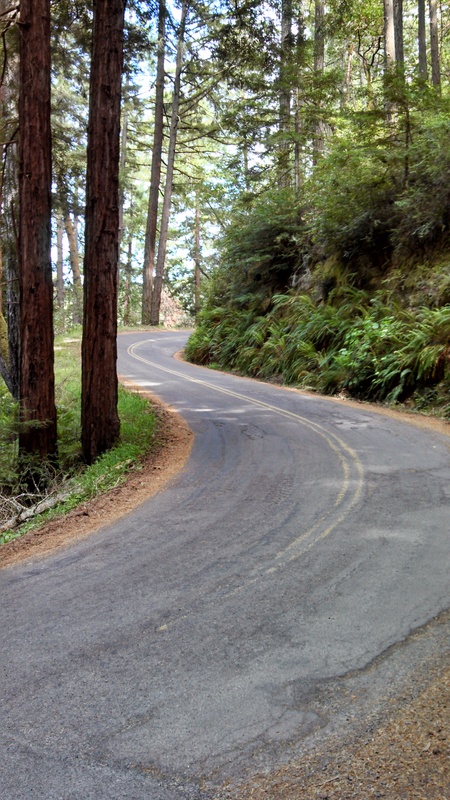 Long, smooth, open roads through the underfunded California State Park. 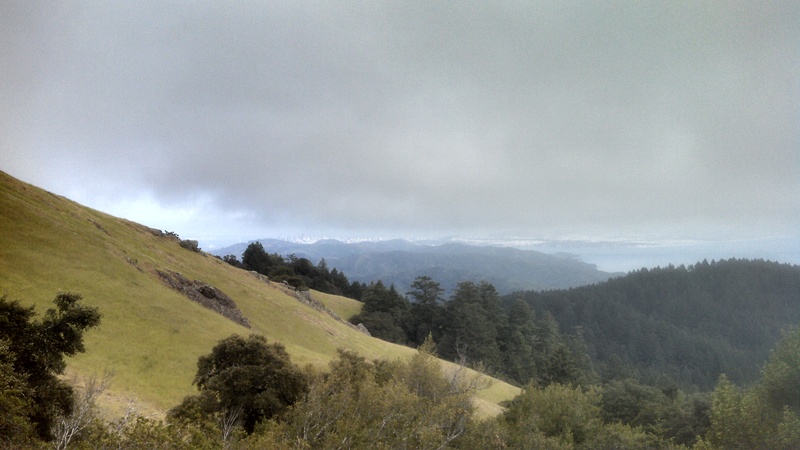 As you descend that little part, you can see San Francisco between the trees. But, the descent is steep and usually wet, so don’t look too hard. One time, in the rain, a cyclist skidded out and crashed in front of my car here. When I stopped to see if he was ok, another bike ran into the back of my car. Not good. The city looked a lot clearer with my actual eyes than in this photo. You can see it just below the clouds. That road dead-ends into Panoramic Highway at Pantoll Station. 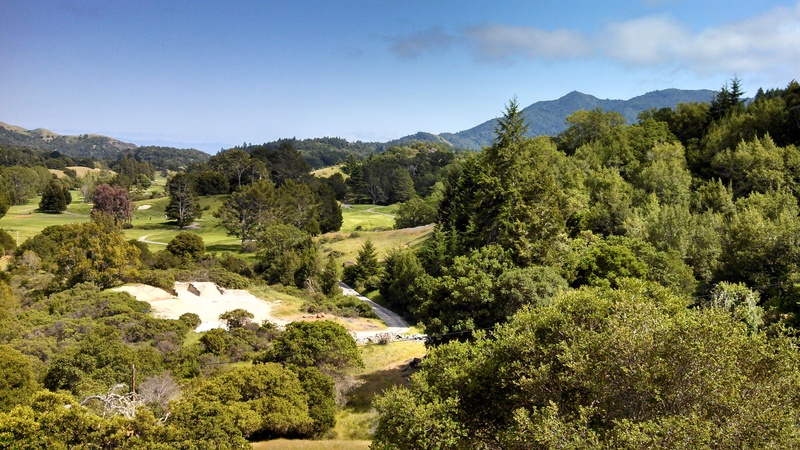 Turning right takes you down to Stinson Beach and left takes you back into populated Marin. Make the left, watch for cars, and you’re on your way home. This descent is actually really annoying — or, rather, it would be super awesome fun times if there weren’t cars. In the summer and on weekends, it’s pretty much a steady line of cars on Panoramic and most of them are rentals and don’t know how to drive mountain-y curvy roads or around bikes. If you know how to descend, you’ll bike the same speed or faster than the cars. If you don’t know how to descend, you will probably freak out. I find that it’s easier to just ride the middle of the lane as long as I’m going the same speed and then pull to the right on the flat or hilly sections when the cars can pass. It doesn’t always go well. At this point, you’re back on Marin Bike Route 15. (Map in that link.) 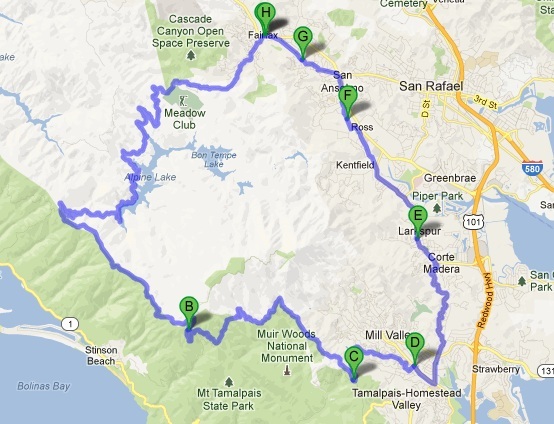 Right to Camino Alto and then left on Camino Alto and up and over the hill. (I don’t always feel up for another climb, so sometimes I take the shortcut next to the freeway, but it’s shittier.) Descend Camino Alto, which turns into Corte Madera Avenue, which turns into Madera Avenue. Continue following it through towns until to you get to College of Marin. Veer left-ish at the gas station/Woodlands Market/College of Marin parking lot intersection onto Kent Avenue through Ross. Turn left at the dead-end at Ross Commons, quick right onto Shady Lane at the church. Shady Lane gets hella decked out for Halloween, fyi, and is definitely on the list of places I’d like to have one of the super fancy mansion houses. Right on Bolinas Ave (different Bolinas Ave) at the other church and quick left onto San Anselmo Avenue through downtown San Anselmo, turning left at the other end of downtown — like four blocks later — to stay on San Anselmo Ave. That turns into Lansdale Avenue and you’re back in Fairfax! The whole loop takes around 2:30-2:45 for me, depending on how hard I ride. Most people also have to ride on and off the loop to get to their houses. Depending on the route I take to and from my house, it takes 3:00-3:30 and is about 37-45 miles — but, come on, it’s a crazy amount of climbing. 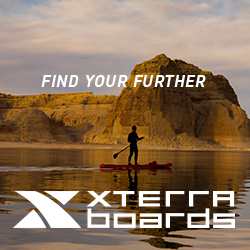 The loop itself is only 32 miles, but worth it. Trust. Totally follow the directions from this map. And, then, I was trashed and ate half a pizza and some bars and hummus and gaucamole and wine. And, I don’t feel so good. Previous Post A joke Steve told me that I try to live by. I agree! It’s a good one — can be challenging!